The Constitutional Court (Concourt) delivered a watershed judgement yesterday. It ruled that the Constitution gives the Speaker of Parliament the discretion to determine the voting procedure in a motion of no confidence in the President and must not be exercised arbitrarily or whimsically. I was surprised by the Concourt’s exorbitant cost order against Parliament. In my view, I believed that the Speaker’s concerns regarding the silence of the Constitution on the procedure for such a motion was a valid concern and her response was appropriate to the opposition parties’ request. However, I realised that it is likely that the Concourt wanted Parliament’s attention and to take cognisance of its ruling and the advice it offered. So, what did the Judiciary have to say to Parliament? Chief Justice Mogoeng Mogoeng emphasised that it’s ruling was unanimous. 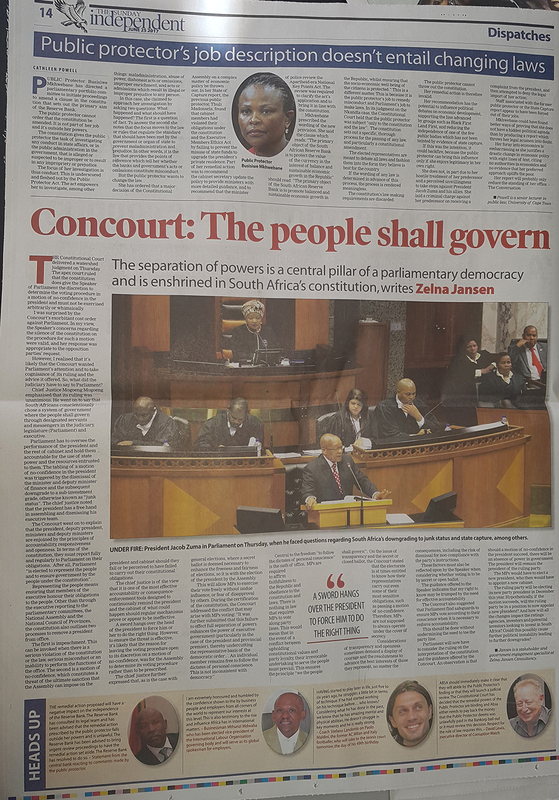 He went on to say that South Africans conscientiously chose a system of government where the people shall govern through designated servants and messengers in the Judiciary, Legislature (Parliament) and Executive. The powers and resources assigned to each of these arms do not belong to the public-office-bearers who occupy positions of high authority. These messengers, servants or public-office bearers must be successful people who are unwaveringly loyal to the core constitutional values of accountability, responsiveness and openness. These office-bearers must ensure that they manage state resources on behalf of the people for the good of the people. Parliament has to oversee the performance of the President and the rest of Cabinet and hold them accountable for the use of State power and the resources entrusted to them. The tabling of a motion of no confidence in the President, was triggered by the dismissal of the Minister and Deputy Minister of Finance and the subsequent downgrade to a sub-investment grade otherwise known as “junk status”. The Chief Justice in an obiter dictum noted that the President has a free hand in assembling and dismissing his executive team. The Concourt went onto explain that the President, Deputy President, Ministers and Deputy Ministers are enjoined by the principles of accountability, responsiveness and openness. In terms of the Constitution, they must report fully and regularly to Parliament on their obligations. After all, Parliament “is elected to represent the people and to ensure government by the people under the Constitution”. Representing the people means, ensuring that Members of the Executive honour their obligations to the people. Other than through the Executive reporting to the Parliamentary committees, the National Assembly (NA) and the National Council of Provinces, the Constitution also provides for two processes to remove the President from office. The first is impeachment. This can be invoked when there is a serious violation of the Constitution or the law, serious misconduct or an inability to perform the functions of the office. The second is a motion of no confidence, which constitutes a threat of the ultimate sanction that the NA can impose on the President and Cabinet should they fail or be perceived to have failed to carry out their constitutional obligations. The Chief Justice is of the view that it is one of the most effective accountability or consequence-enforcement tools designed to continuously remind the President and Cabinet of what could happen should regular mechanisms prove or appear to be ineffective. A sword that hangs over the head of the President to force him or her to always do the right thing. However, to ensure the threat is effective or to give effect to the fatal bite, it is likely that the reason for leaving the voting procedure open to its discretion on a motion of no confidence, was for the NA to determine its voting procedure for itself rather than being prescribed. Central to the freedom “to follow the dictates of personal conscience” is the oath of office. MPs are required to swear or affirm faithfulness to the Republic and obedience to the Constitution and laws. There is nothing in law that requires a MPs to vote along party lines. This would mean that in the event of a conflict between upholding constitutional values and party loyalty, their irrevocable undertaking to in effect serve the people and do only what is in their best interests of the people must prevail. This ensure the principle we the people shall govern. On the issue around transparency and the secret or closed ballot, the Concourt stated that the electorate is at times entitled to know how their representatives carry out even some of their most sensitive obligations, such as passing a motion of no confidence. Therefore, MPs are not supposed to always operate under the cover of secrecy. Considerations of transparency and openness sometimes demand a display of courage and the resoluteness to boldly advance the best interests of those they represent no matter the consequences, including the risk of dismissal for non-compliance with the party’s instructions. These factors must also be reflected upon by the Speaker when considering whether voting is to be by secret or open ballot. The guidance offered to the Speaker indicates that my right to know may be trumped by the need for effective accountability. The Concourt also suggested that Parliament find safeguards to ensure MPs vote according to their conscience when it is necessary to enforce accountability effectively. This should be done without undermining the need to toe the party line. Parliament will now have to consider the ruling on the interpretation of the Constitution and the guidance offered by the Concourt. An observation is that should a motion of no confidence in the President succeed, there will be an absence of power in government. The President will remain the President of the ruling party. The MPs would have to elect a new President, who then would have to appoint a new Cabinet. The ruling party will be electing its new party President in December this year. Hypothetically, if the motion succeeds, will the ruling party be in a position to now appoint a new President? And how will all the changes impact the ratings agencies, investors and potential investors looking to invest in South Africa? Could this possibly cause further political instability leading to further downgrades? Here is the PODCAST for the interview we did with Kwena Moabelo on POWER Zone.